Dr. rer. soc. HSG Dirk Drechsler is full Professor at Offenburg University lecturing Risk Management and Compliance. His research mainly focuses on resilient business models, digital business risks, compliance, economic crime, data analytics and working capital management. Professor Drechsler worked as a senior external and internal auditor at KPMG and ista international/Charterhouse Capital Partners. Prior to joining Offenburg University, he was Head of Internal Audit with additional responsibilities as enterprise risk manager, working capital controller and data protection officer at FUCHS Petrolub. He earned his PhD at the University of St. Gallen (Switzerland) and studied international economics with a reference to Japan at the Universities of Duisburg (Equivalent to BA in Economics), Doshisha/Kyoto (Language and Culture Certificate) and Tübingen (MSc in International Economics). Philipp Eudelle is Professor at Offenburg University, Dean of the Faculty of Business and Industrial Engineering and Deputy Head of the Institute for Trade and Innovation (IfTI). His teaching focuses on global economics, economic policy and quantitative methods. He is also Visiting Lecturer at Strasbourg University in France. His main academic research topics are the analysis of the benefit of public research funding and strategies for improvement of research cooperation between public and private organisations. Professor Eudelle was educated at Offenburg University, Ecole Doctorale Augustin Cournot in Strasbourg (DEA) and Strasbourg University (Dr.). Dr. Rebecca Harding is Visiting Lecturer at Offenburg University teaching Digitalisation with a focus on Fintech and Insuretech. She is also the Chief Executive and Founder of Coriolis Technologies, a FinTech company using AI and machine learning to provide data and analytics to the trade finance community. Her academic background is in the interface between economics, innovation and entrepreneurship. Dr. Harding was formerly the Executive Director of the Global Entrepreneurship Monitor at London Business School. She has written extensively on trade, innovation and entrepreneurship but has for the last ten years focused on her business career which includes senior roles at Deloitte, the British Bankers Association and the Work Foundation as well as private consultancies. She founded Delta Economics and Equant Analytics, has advised the UK’s Treasury Select Committee on UK productivity, and is a Director of the German British Forum. Dr. Martina Höppner is Visiting Lecturer at Offenburg University teaching courses on Macroeconomic Risk Analysis. She is also the Chief Financial Officer at KSH, a leading manufacturing exporter for water treatment systems. As former Head of Department Economic Research of the German Export Credit Agency (ECA) Euler Hermes, Martina represented Germany at OECD country risk meetings for export credits. In addition to her role with Euler Hermes, she was also a Visiting Lecturer at Leuphana University of Lüneburg. Martina was educated at the University of Gothenburg (MSc in Business Administration), the London School of Economics and Political Sciences (MSc in Development Studies), the University of St. Gallen (Doctoral Studies) and the Vlerick Leuven Gent Management School (Executive Master in Corporate Finance). Dr. Chris Jeffs is Visiting Lecturer at Offenburg University teaching courses on Strategic Management as well as Innovation and Design Thinking. He has authored books, chapters and research papers on strategic and innovation management, design thinking and international business. Chris is also Associate Professor in Strategic Management at Grenoble Ecole de Management (France), a Strategy Expert on the eMBA at IMD in Switzerland, and a Senior Examiner at the Chartered Institute of Marketing. In addition, Dr. Jeffs is Owner Director of Form Strategies, a company that specialises in executive coaching and facilitating strategic innovation. He also serves on the Advisory and Decision Committee of the Mohammed Bin Rasheed Innovation Fund in the United Arab Emirates. Dr. Chris Jeffs completed his MBA and Doctorate (Northumbria University, UK) on the topic of knowledge transfer and organisational innovation. Andreas Klasen is full Professor of International Business and Head of the Institute for Trade and Innovation (IfTI) at Offenburg University, Visiting Professor at Northumbria University (UK) and Senior Honorary Fellow at Durham University (UK). His research focuses on trade policy, export finance, innovation and economic development. He also advises multilateral development banks and governments on benchmarking, market analysis, strategy and process improvement. Until 2015, he was a Partner with PricewaterhouseCoopers and PwC’s Economics & Policy leader, serving also as Managing Director of the official German export credit and investment insurance agency. Professor Klasen was educated at the University of Wuerzburg and the University of Hanover (1st and 2nd Legal State Exam), at Northumbria University (LLM and DBA) and the University of St Andrews (MLitt). 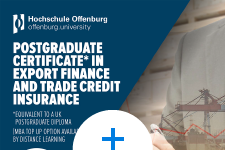 Dr. Simone Krummaker is Fellow in the Institute for Trade and Innovation (IfTI) and a Visiting Lecturer at Offenburg University teaching courses on International Financial Markets as well as Insurance Markets and Regulations. Her research focuses on insurance and risk management, in particular on corporate demand for insurance. Dr. Krummaker is also Senior Lecturer in Insurance at Cass Business School, City, University of London (UK) and a Senior Research Associate at the Center for Risk and Insurance, Hannover (Germany). Previously, she worked as Senior Lecturer in Finance at the University of Westminster, at the University of East Anglia London and as Senior Researcher at the Center for Risk and Insurance and Associate Lecturer at the Institute for Insurance Economics, both at Leibniz University of Hannover (Germany). Dr. Krummaker holds a doctoral degree (Dr. rer. pol.) and a high level German University degree (Diplom Ökonom) from Leibniz University of Hannover. She is also a certified insurance professional (Versicherungskauffrau, Chamber of Industry and Commerce). Dr. Henning Meyer is Visiting Lecturer at Offenburg University teaching courses on Corporate Diplomacy in the context of global strategy, public policy and shared value. His business research focuses on the intersection of strategic management and public policy. Dr Meyer is Visiting Fellow at the Centre for Business Research (CBR) at Cambridge University (UK) and Director of the consultancy New Global Strategy. He is also Research Associate at the Public Policy Group of the London School of Economics and Political Sciences (LSE, UK) and was a John F. Kennedy Memorial Policy Fellow at Harvard University (US). Dr. Meyer was educated at the University of Trier (Germany), several London Universities and Oxford University in the UK. He holds an MA and PhD in Politics, an MSc in Financial Economics as well as an Executive MBA and the Oxford Diploma in Global Business. Anne Najderek is Professor at Offenburg University for Business Administration, Financial Reporting and Accounting, teaching courses on Financial Accounting and Reporting. Since 2017, she also is the Prorector of the University for Academic Affairs. As a member of the Institute for Trade and Innovation (IfTI), her actual research focuses on public accounting. Until 2012, Professor Najderek was Head of Financial Accounting and Reporting at the Central Institute of Mental Health in Mannheim (Germany). Prior to that, she was a project manager at the finance department at the University of Mannheim. Anne was educated at the University of Mannheim. Dr. Lars Ponterlitschek is Visiting Lecturer at Offenburg University. As Head of Finance & Risk and Member of the Management Board of Swiss Export Risk Insurance (SERV), Lars is responsible for risk and portfolio management at the official Swiss export credit agency (ECA). He is also responsible for the departments Risk Assessment, Claims & Recovery, Legal & Compliance as well as Finance & Controlling. Dr. Ponterlitschek gained vast underwriting and project finance experience at the German ECA Euler Hermes and SERV before assuming his current role. Lars has a PhD in economics and was a Visiting Lecturer at HAW, Hochschule für Angewandte Wissenschaften in Hamburg, where he taught macroeconomics. Nadja Scheurer is a Visiting Lecturer at Offenburg University teaching courses on Underwriting and Portfolio Management. She acquired profound underwriting experience of corporate risk and project finance transactions at the German export credit agency (ECA) Euler Hermes. Ms. Scheurer was also assigned as an ECA specialist to the European Investment Bank in Luxembourg where she arranged offshore wind transactions gaining experience in structuring layered funds in the renewable energy sector. She also worked at a large logistics company in Germany where she was responsible for managing the Eastern European subsidiaries arranging capital measures as well as debt financings. Nadja Scheurer holds a Master in Economics from the University of Leipzig. Anisse Terai is Visiting Lecturer at Offenburg University teaching courses on Islamic Finance and Insurance. He is Head of Asset Management, Policy and Partnerships at the International Islamic Trade Finance Corporation (ITFC), the trade specialised arm of the Islamic Development Bank (IDB) Group. In addition, Anisse Terai is Adjunct Professor at Université Paris Dauphine (France). He has extensive experience in finance, strategy, policy, project management, trade and market analysis. Before working for IDB, he was Assistant Professor and Assistant Dean at Institut d’Etudes Politiques de Paris (Sciences Po, France). Anisse Terai holds a Bachelor’s degree from HEC Alger, a Master’s Degree from Sciences Po, and a Post-Master Degree from the French Ecole Nationale d’Administration (ENA). 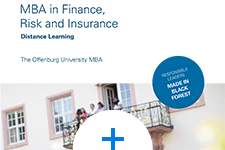 Thomas Wenger is full Professor at Offenburg University teaching courses on Corporate Finance. His research interests are financial economics, quantitative methods in financial risk management and financial market reform. Until 2017, he was part of the Group-risk team of a German wholesale bank, co-responsible for model validation and macroeconomic stress testing. Thomas has taught courses on corporate finance, financial institutions and quantitative methods in finance at the University of Passau (Germany), where he also continues to be a Visiting Lecturer. As a member of the advisory team of a big four audit firm, he supported banks in the implementation of integrated risk management frameworks. He was also a Boas Assistant Professor of Mathematics at Northwestern University. Professor Wenger received his PhD in mathematics from the University of Münster (Germany) and his Diplom from the University of Heidelberg (Germany).